Make every run count in the Reebok® Running Speedwick Tights! Slim Fit wears close to the body and moves with you during exercise. Speedwick technology wicks sweat from the body to help you stay cool and dry. Elastic waistband. Antimicrobial gusset prevents odors. Flatlock stitching sits flat against the skin and prevents chafing. 86% polyester, 14% spandex. Machine wash cold, do not tumble dry. Imported. Measurements: Waist Measurement: 26 in Outseam: 36 in Inseam: 27 in Front Rise: 9 in Back Rise: 13 in Leg Opening: 8 in Product measurements were taken using size SM, inseam 27. Please note that measurements may vary by size. 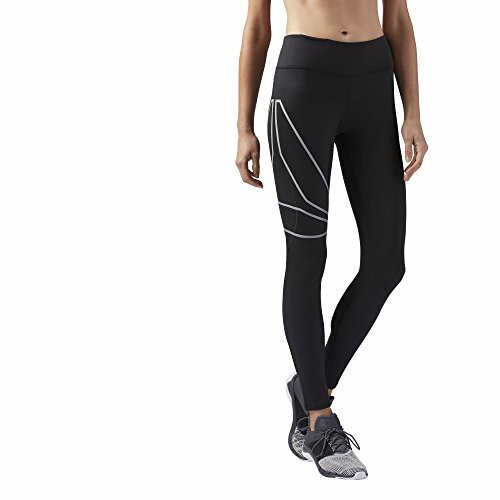 Make every run count in the Reebok® Running Speedwick Tights! Slim Fit wears close to the body and moves with you during exercise. Speedwick technology wicks sweat from the body to help you stay cool and dry. Antimicrobial gusset prevents odors. Flatlock stitching sits flat against the skin and prevents chafing. 86% polyester, 14% spandex. Machine wash cold, do not tumble dry. Imported. Measurements: Waist Measurement: 26 in Outseam: 36 in Inseam: 27 in Front Rise: 9 in Back Rise: 13 in Leg Opening: 8 in Product measurements were taken using size SM, inseam 27. Please note that measurements may vary by size.